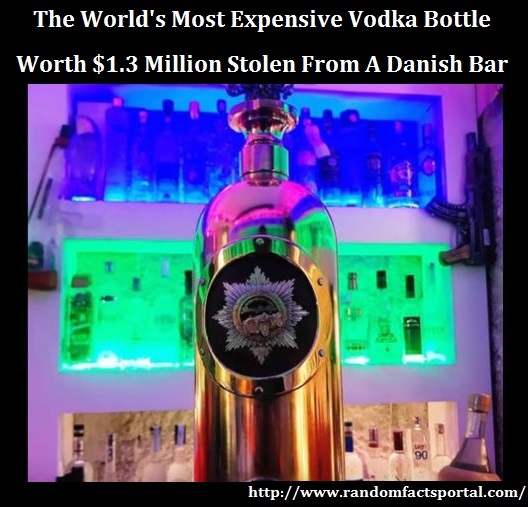 The world’s most expensive a Russo-Baltique vodka bottle worth $1.3 million recently disappeared from a Danish bar. Apparently, the bottle is covered with roughly 6.6 pounds of gold and 6.6 pounds of silver. According to reports, the bottle has a diamond encrusted cap and it is shaped like a Russian imperial eagle. It was given on loan to a Copenhagen bar which had a collection of vodkas on display. Along with that, the front side of the bottle is decorated with leather. The actual bottle is made of bullet-proof glass, in case you get involved in some James Bond-level martini drinking. CCTV footage shows an intruder grabbing the Russo-Baltique vodka and fleeing the bar. However, the footage doesn’t reveal the face of the thief and hence it has made it difficult for the police services to catch him. Here is the CCTV footage. The vodka bottle got a special mention in the famous TV series House of Cards when a bottle was gifted by Russian President Victor Petrov to President Frank Underwood at a state dinner.